Every once in awhile I go treasure hunting, which in my case means hitting some vintage stores, antique shopping, or estate sales. I usually head out searching for a particular object (on this day, I was looksing for a nit age type writer) but most the time the treasures I end up bringing home with me are a complete surprise. An object that just spoke to me . . .
For instance this beauty . . .
And I knew exactly what I was going to do with this. Before I even made it home, I stopped by my local Home Depo and had them cut some wood the size of this frame (which happens to be 40 x 30), some chalkboard paint and some new brushes. See, I had a vision . . .
It’s my new doodle board or in other words . . . my antique chalkboard. I’m having so much fun with this treasure. And with its huge size it can go from room to room and just be placed on the floor and looks awesome, such a focus point and conversation piece. This was another treasure I found on the same day . . . 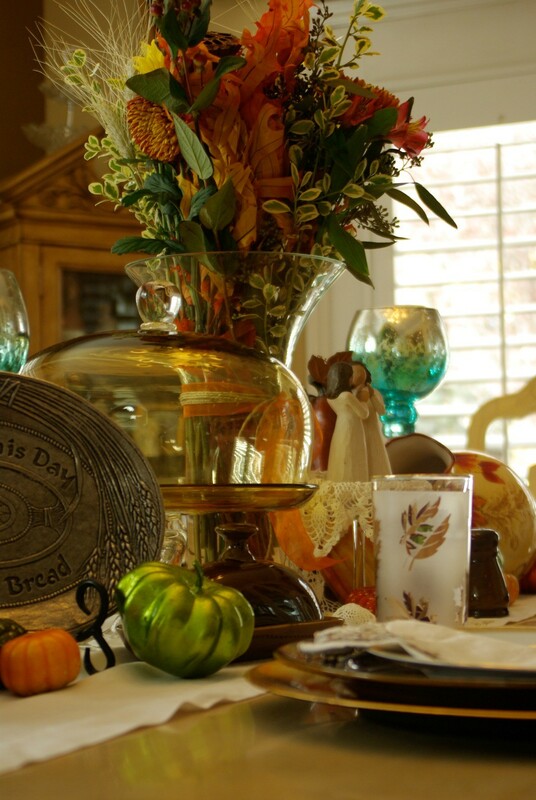 I knew the color of this antique cake stand would fit right in with my fall and Thanksgiving decor. 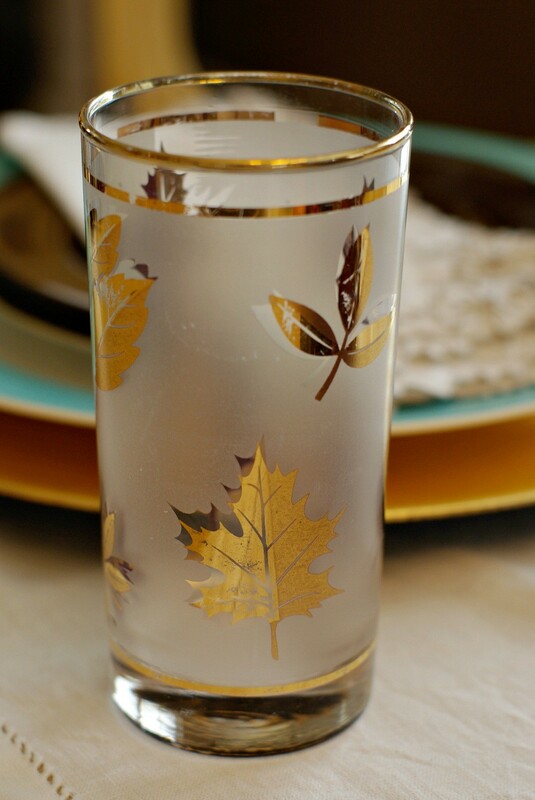 I spotted a set of vintage glasses but the set was incomplete and I knew I at least needed 6 to entertain and mix and match. My wonderful mother came to my rescue . 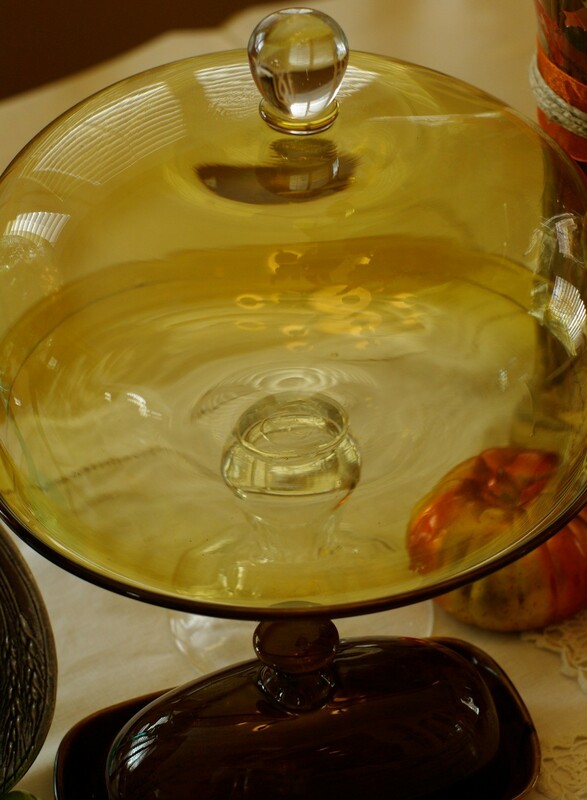 . .
She was certain she still had a set of the same ones sitting in one of her cabinets. Now the creative playing begins . . . 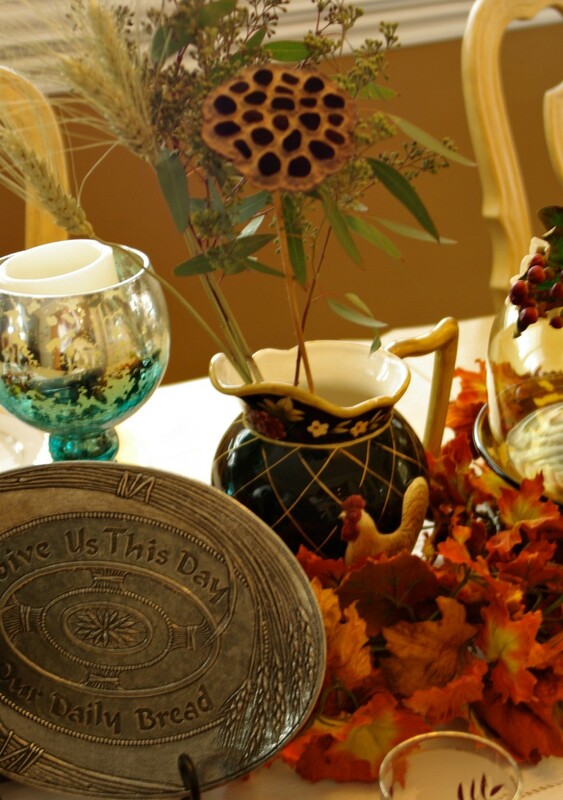 When I set my table and centerpieces, I just pull from objects old and new. 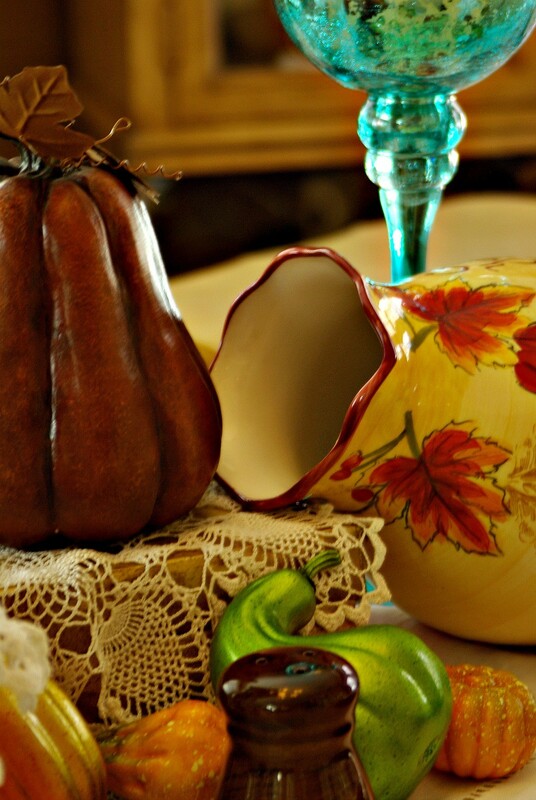 I wanted to incorporate the cake plate and glassware so I pulled a few more vintage finds . . . I do try to mix old and new, metal and glass, and heights. It’s ok to lay a pitcher on its side . . .
And use books for stacking . . .
And a bit of twigs from a morning walk. I just play around until it seems complete and inviting. Amazing where a treasure hunt can lead you. . . 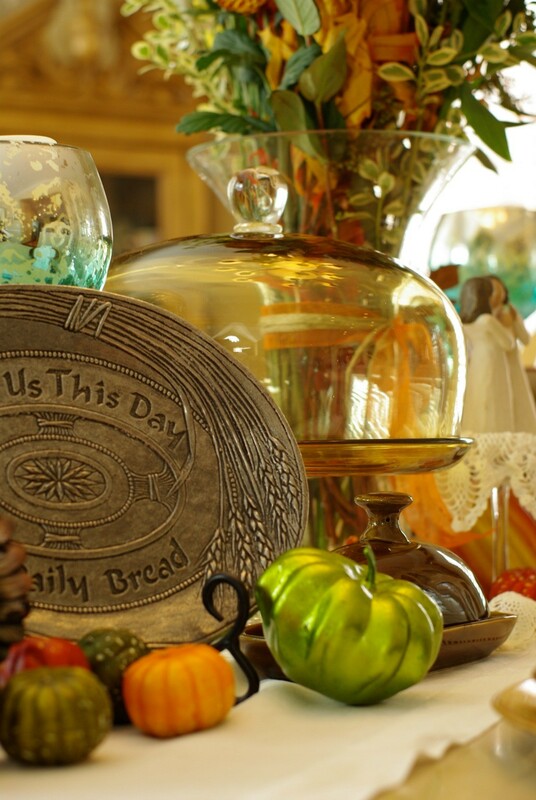 Linking up with Jann for SYC where I’m sure you’ll see some other creative Thanksgiving table displays. 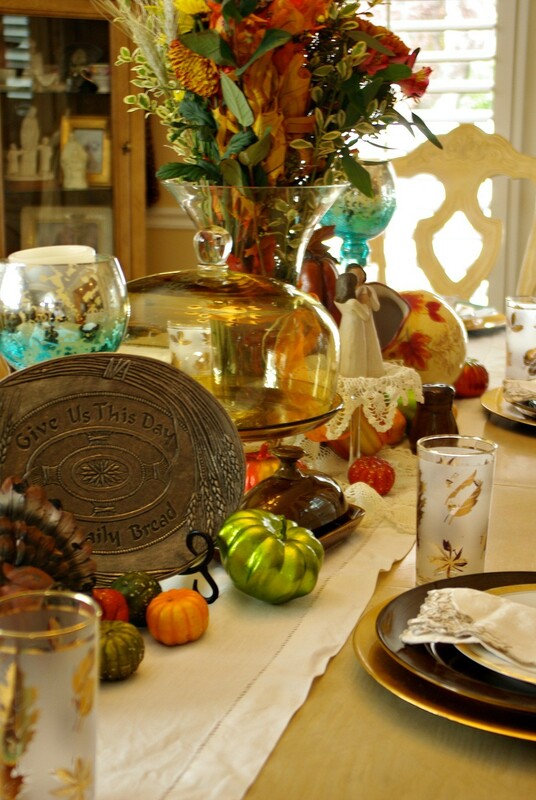 Again a fabulous table(setting). We used to go treasure hunting too. Especially to a collectors market which is held in The Netherlands twice a year. Loads of beautiful old things brought together by collectors. But at a certain point our little house was really full. Really. We had to stop. I too love a good treasure hunt. I can see where that homemade chalkboard would be super handy. I could have used something like that when I still did jewelry shows. What a clever use for that pretty frame. Chalkboards are fun. I bought one as a prop for my blog last year and enjoy playing with it. What a great find on the golden frame. 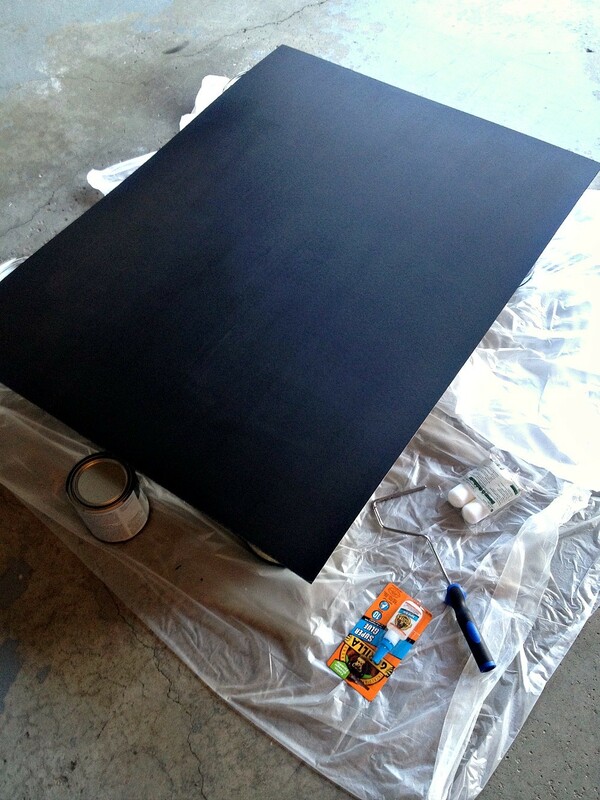 I love the idea of turning it into a chalkboard frame. You did manage to find real treasures. That frame is beautiful, what a perfect size and lovely patina. I Love how you made it into a chalk board! 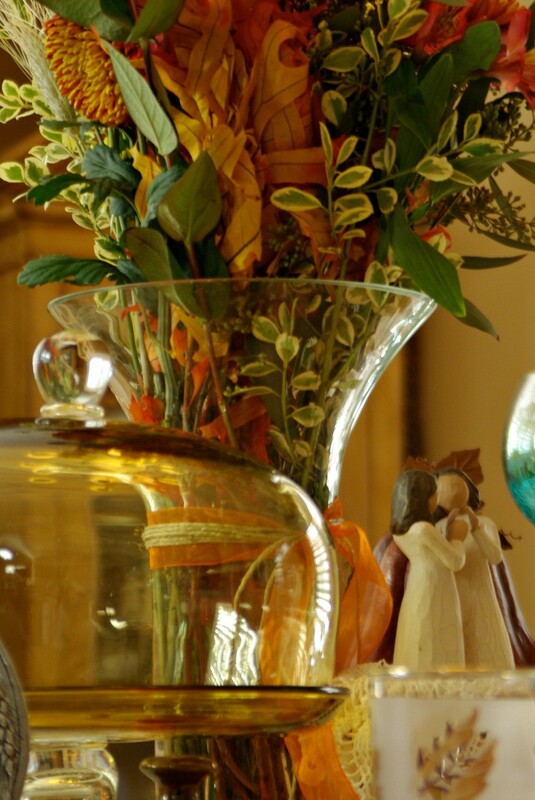 Love the new glasses , too, and that cake stand is fabulous. 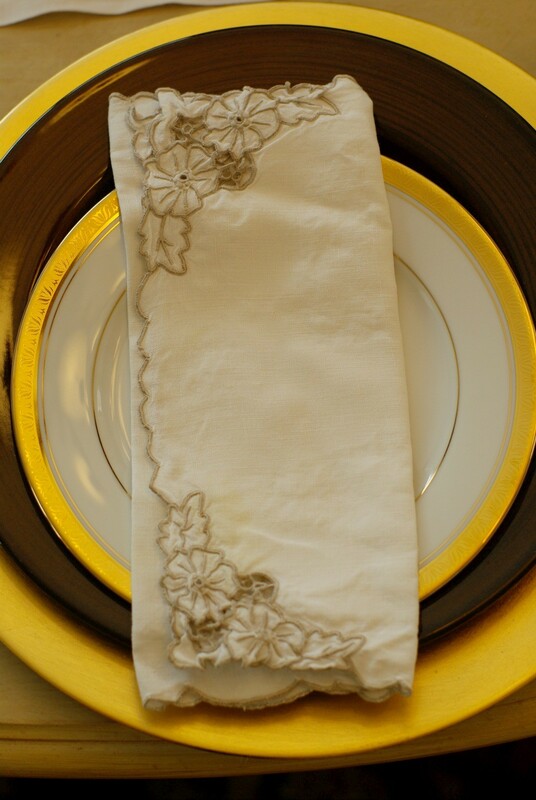 I also love pulling old an new together when i decorate, dress, or set a table! 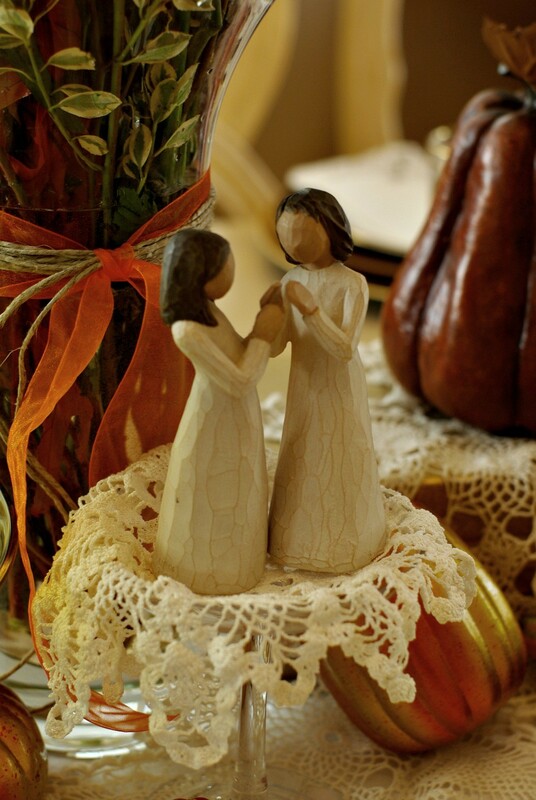 Now that my parents are both past on, I have some of their small treasures in certain spots in my home and it makes me happy ( and a bit sad, too.) but more happy. I will take photos one day soon, I hope. 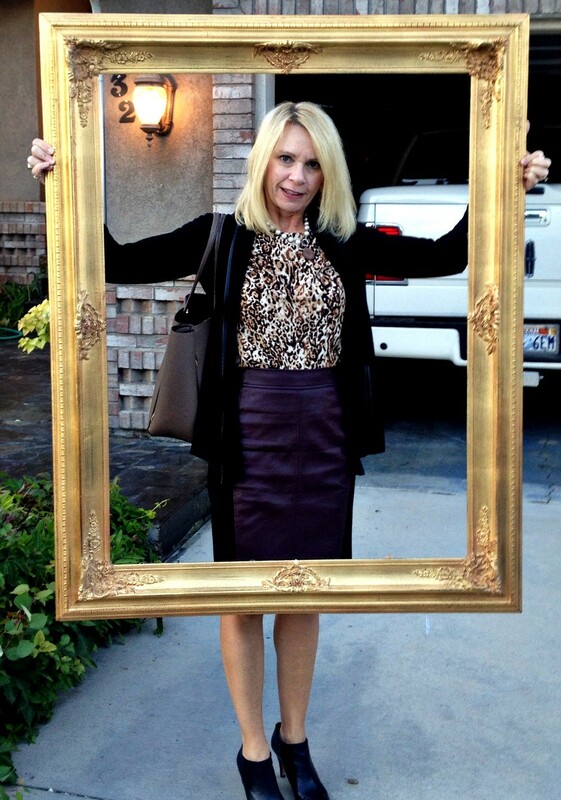 the plum pencil skirt with the leo and black… amazing and I am glad it is framed! You are so creative! I love the chalk board in that gorgeous frame! Perfect! And your hostess skills AMAZE me! Isn’t it fun playing house Trina? lol! Oh my, talk about a walk down memory lane. My mom had those glasses. Not sure who ended up with them. 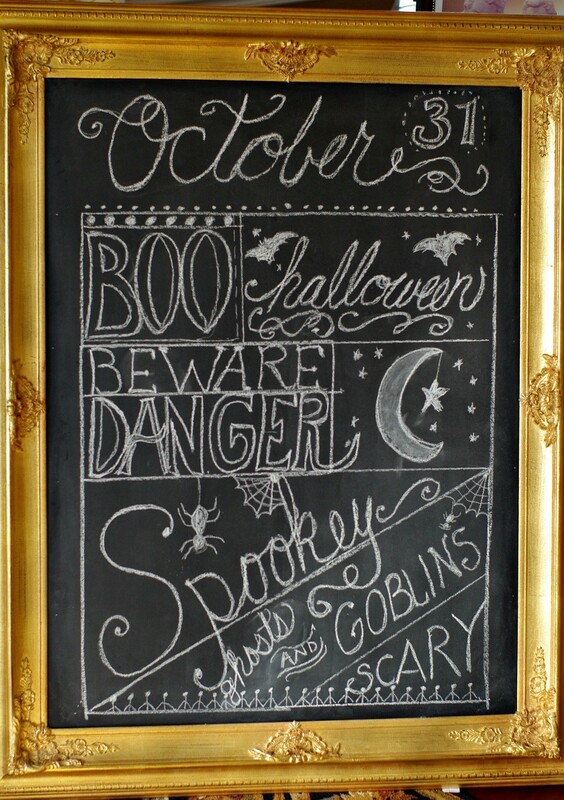 That frame is gorgeous and I love your chalkboard art! I have an old window that I chalkboard in and I love it. It sits empty right now. Just erased my acorn art and waiting for inspiration for Christmas. I found a large frame (not as large as yours, but pretty cool at the D.I.). I need to finish giving it a makeover and get it up! Thanks for sharing with SYC.